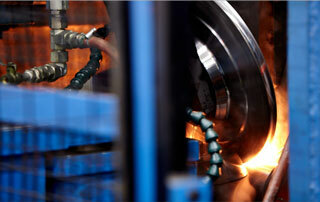 Welded Tube’s broad customer base is a reflection of its expansive capabilities. Welded Tube has engineered proprietary testing equipment, in addition to continuous online Non-Destructive Testing, to ensure the weld strength and tensile tests performs beyond the requirements of the application. Welded Tube’s modern high-speed mechanical ERW tube mills manufacture an industry leading range of shapes. This includes everything from the standard commodity shapes to custom shapes such as oval and tri-oval tubing. We also offer a variety of steel types and grades, from HSLA / low, medium and high strength steel. Our rolling cycles and inventory programs are designed to meet the competitive just in time demands of the marketplace. Welded Tube manufactures mechanical ERW tube with various surface conditions, including cold rolled or hot rolled, pickled and oiled, or hot rolled black. Welded Tube shaped and round mechanical ERW tubing is suitable for high precision laser processing. Our round tubing has minimal ovality and a true form. Welded Tube’s cutting facility and packaging capability supports specific end user requirements and the demands of JIT scheduling. Customers rely on our high-performance, high-volume cutting machines to deliver their cut to length tubing on time.